Amie Just with NOLA.com is reporting that LSU Football coach Ed Orgeron will receive a contract extension and that the details are being finalized. LSU head football coach Ed Orgeron will receive a contract extension, a LSU senior official confirmed to NOLA.com | The Times-Picayune on Wednesday afternoon. The official said the details of the contract extension are being finalized. 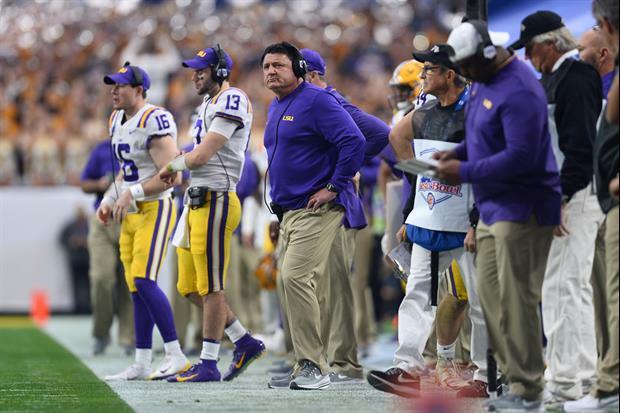 Orgeron led LSU to a 10-3 record in 2018, the best record for the Tigers since the 2013 season. Congrats Coach O. You earned it! Would think getting Miles off the payroll contributed to this decision as well as more money should be available now. Y'all act like he's gonna be getting Saban money... He is getting pennies compared to the other coaches in the SEC. I do not have a problem with this because A) he basically gave half of his paycheck to Aranda to keep him and B) he exceeded expectations this year. I don't think he deserves top 3 sec money, but I'm ok with bringing him up to the middle of the pack... Hell, the Arkansas coach is making more than him! Contract extensions should be used so nobody steals your coach. LSU gives its football coaches “golden parachute contracts” that they continually kick down the road. He had a good year, but doesn’t need a financial windfall waiting the in the wings because of it. To be fair. If he doesn't get one it will be used against him on the recruiting trail. Well deserved. Keep up the good work Coach. Powerhouse?? ....slow down buddy. We had a good season, but we're not a powerhouse(yet). Yea we were two plays away from a 1 loss season and the playoffs. I would say the tigers are back. Why now? Can’t wait a year to see if he can, at least, duplicate what he did this past season? Well deserved. Only an idiot would think otherwise. Well deserved? You do understand the purpose of contract extensions right? He had one successful season. He absolutely exceeded expectations, but he has not earned a contract extension yet. Who else is going to hire him away? The smart move would’ve been to wait until after next season. But, yet again, Alleva fricks up a contract because he has no clue what he’s doing. The purpose is to build confidence with recruits in the program and the staff but you fail to see the big picture because you dont like O. Not bad for the man who brought us an 11-2 record (frick the SEC refereeing and GayNM). 2005,2006, and 2010 were LSU's only 11-2 seasons ever. Les was the coach. Dang. Ed gave us only our fourth 11-2 season ever? Impressive. 10-3 when you were predicting 5 or 6 wins. I remember before the start of the season, the haters constantly told everyone that would listen to them that Orgeron would be fired before the end of the season because he is a horrible coach. Yeah right. Meanwhile, the only reason why LSU didn't finish 12 & 1 this past season is that we lost two very good tight ends right before the start of the season and K'Lavan Chaisson, who was supposed to be one of the top pass rushers in the SEC this past season, was lost for the season in the first game against Miami. Not to mention, the other two players that were suspended for the season. Really? That’s the only reason why? Fantastic hire! Fantastic raise! Fantastic extension! When Coach O says he's coming, he's coming!